This whole venture was in danger of becoming one big “meh” fest. I have not been super wild about any of the winners the past 4 years. 2010, though, oh man, 2010 brought it. 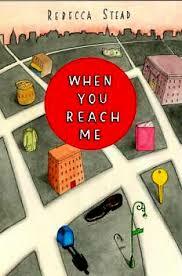 This is not the first time I’ve read Rebecca Stead’s When You Reach Me. It’s not even the second time. I’ve actually lost count of the number of times I’ve read this book in just the last four years. The plot is sparse. Miranda lives on the Upper West Side of Manhattan in the late ’70s. She’s just trying to have a nice life with her friends and her single mom (who is about to be a contestant on $20,000 Pyramid) and read A Wrinkle in Time as many times as is humanly possible. The only things getting in her way are that her friends might not be her friends anymore and also she is getting some seriously creepy notes that either make no sense at all or appear to predict the future. But that little story packs so much punch and oh my I love it so. The opening chapter is a thing of beauty. Rebecca Stead has a way with beginnings. I feel the same way about her last novel, Lair & Spy. “I think about the letter you asked me to write. It’s nags at me, even though you’re gone and there’s no one to give it to anymore… It’s all still there, like a movie I can watch when I want to. Which is never.” You have no idea what she’s talking about but it’s riveting and lovely and her beginnings should be studied. Miranda is a artfully painted character with minor flaws that make her believable enough while staying relatable. She is accidentally mean to her friends sometimes. She is unnecessarily judgmental of others at other times. And it’s the way that she deals with these little flaws that make the story so lovely. “Sometimes you never feel meaner than the moment you stop being mean. It’s like how turning on the light makes you realize how dark the room had gotten,” Miranda narrates. She grows up so much in those two sentences and I just want to hug her. The book is full of observations and turns of phrase like that. “You will come back with a mouth full of paper” has, to me, that same quality as the phrase “cellar door”; it just sounds really beautiful when you say it, you don’t know why. Also, the time travel! I will cover how much I am deeply in love with A Wrinkle in Time later on in the project because yay! It’s a part of the project. But suffice it to say I have a tesseract tattooed on my inner arms. So, I am probably biased towards this whole aspect of the story, but it really makes me love this book even more, if that’s possible. Would kids like it? It’s not a book for reluctant readers the way Dead End in Norvelt is really a kids’ kids’ book. But I know there are plenty of 5th graders who loved this book as much as it did. Miranda is too relatable to not grab the imagination of a good number of cool kids. Are there “funny bits”? Not really! Miranda definitely has a sense of humor herself, but she’s not funny, and there are few funny situations. I don’t miss the funny, though. And it’s not sad, just not funny. Do I get why it won? 2010 was the only year when I actually had an opinion about what book I wanted to win the Newbery that year before it was annouced. I refreshed the ALA’s twitter repeatedly that morning hoping to see When You Reach Me. So, yes, I get it! And speaking of Newbery announcements, I’m actually going to go ahead and publish this one Sunday night rather than Monday morning, because Monday morning is when 2014’s winner is revealed! I haven’t read most of the front-runners this year, so I won’t be able to weigh in with any educated opinion right away, but I’m excited to find out. And then there’s the question of when I fit the winner into the project. Now? The end? I still haven’t decided.